Some of you may remember my first guest contributor, JT Ringer, from his earlier post Canapes ala JT. 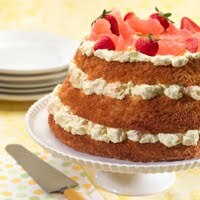 Well, he is back on the Fake-n-Bake blog with his towering strawberry cream cake! 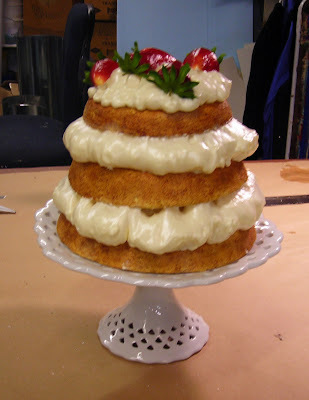 Yet another picnic delicacy for 'Albert Herring', this cake is a delight for the eyes. We decided against the grapefruit. Each layer of the cake is carved from bead foam, which lends itself well to the spongy nature of the angel food cake. After a coating of Jaxsan, the layers were painted by the talented Ilana Kirschbaum to give them that golden brown, fresh-from-the-oven look. JT assembling the cake layers. Notice his use of splash proof goggles, nitrile gloves, and a respirator. You can't tell from the photo, but he's working outside to spare his co-workers the fumes. How considerate! The cream in this cake is made with Great Stuff expanding foam. The foam is adhesive, so it holds the layers together, and holds the (purchased) fake strawberries to the top without additional glue. It is lightweight and durable as well, and is very useful in the making of food props. The thing to remember, though, is that Great Stuff expands as it cures, so it's important to plan ahead. Notice how the prop cake is slightly more towering than the research photo? Yup, expanding foam. Luckily, this precarious tower of angel food cake is the perfect opera prop- scrumptious looking, and ever so slightly larger than life.